Strictly speaking, a "plastic" is any material that can be molded or pressed into a desired shape. In manufacturing circles however, it has come to be applied to a wide range of synthetic materials divided into several distinct classifications based on their chemical nature and methods of manufacture. Aside from trade-name classifications, these include the various types of phenol molding powders, celluloid, pyroxylin and other cellulose compounds, ureas, casien, and acetates and many others. For homecraft purposes and the purposes of this book however, the term "plastics" applies only to cast phenolic resins, or phenolic formaldehyde condensates, to use their technical name, a material supplied to manufacturers in rod, sheet, tubes and special forms, a few of which are shown in Plate B, which is cut or machined by them in various ways to produce the finished product. Cast resins are practically the only type of "plastics" suitable for homeworkshop use, since they are the only type that can be worked with ordinary homeworkshop or school manual training equipment designed for wood or metal-working. All other types, such as molding powders, etc., require special dies shaped like the finished product, and expensive equipment, and are suitable only for making large quantities of identical objects. PLATE B. 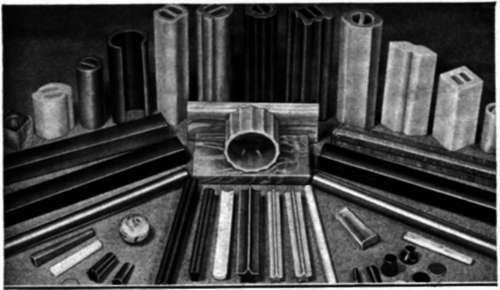 (Above) Some of the various shapes in which cast resin plastics are available rods, sheets, tubes, cylinders and special-shaped castings. There are a half-dozen or more brands on the market, having practically identical physical and chemical characteristics, sold under various trade names, but all designated as "cast phenolic resins". Certain of the other "plastics" are also available in rod and sheet form, but are not as adaptable for homecraft work as cast resins. Caseins, for example, warp in any sheet-size over 4" square, and take up water, being still, for all practical purposes, an organic material. Cellulose nitrates (celluloid, pyroxylin and various other trade names) are highly inflammable, and available usually in only thin sections. Cellulose acetates are very slow-burning and have good color, but are also slow-curing and therefore expensive in the thicker sections as well as being affected by various solvents and chemicals. Ureas also absorb water, are not acid-resisting and swell in the presence of moisture. Of the laminated materials, these usually contain mineral fillers, abestos or cotton flock, which makes a perfect finish impossible and machining difficult. Each material has its very definite place in industry which it fills better than any competitor, but for homecraft purposes, the most easily workable and the most satisfactory in every respect is cast phenolic resin. Besides its other advantages, cast resin shapes are considerably cheaper than the same shape in other comparable materials. The principal components of cast resin are formaldehyde and carbolic acid (or phenol crystals). 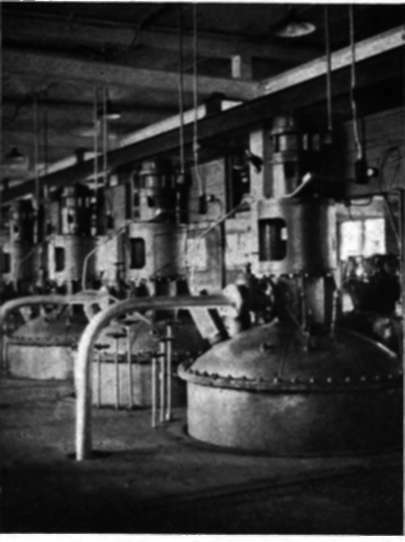 Omitting the technical details, the mixture is cooked together in kettles ranging from 750 to 1500 pounds capacity for 18 hours, Plate C, when it becomes a clear syrup-like liquid, which, after color is added, is poured into lead molds, and baked or vulcanized at a temperature of around 200 degrees for a period of five days. Photos of various steps in the process are shown in Plates C, D, E, F.
PLATE C. (Lower Left) A battery of the kettles in which the ingrediants are cooked. PLATE D. (Lower right) After cooking, the syrupy liquid is run into hand-kettles, from which it is poured (see Plate E). In order to understand the shapes in which this material is available, an understanding of the casting process and molds is necessary. First a steel "arbor" is made, having exactly the same shape as the finished product is to have. If these are long and narrow, as is usually the case, a number of identical arbors are grouped together on a handle so that they can all be dipped at one time. These arbors must have a one-way draft, and a very slight taper, amounting to about .0015" to the inch, for reasons that will become apparent as the succeeding steps are explained. 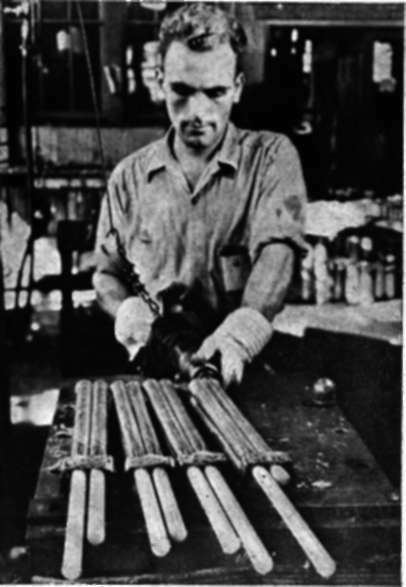 This set of arbors, usually comprising from 6 to 30 duplicate shapes, all attached to the handle-plate at their larger ends, are then dipped into molten lead and withdrawn. The timing of the operation causes the cold steel to solidify a thin shell of lead around each arbor. This group of shells, all attached together at the top is then stripped from the steel, leaving a set of hollow leaden molds, extending down from a sort of "pan" formed by the lead which congealed around the top. This is clearly illustrated in Plates G and H.
PLATE G. The thin lead shell molds are formed by dipping steel arbors into molten lead (lower left). 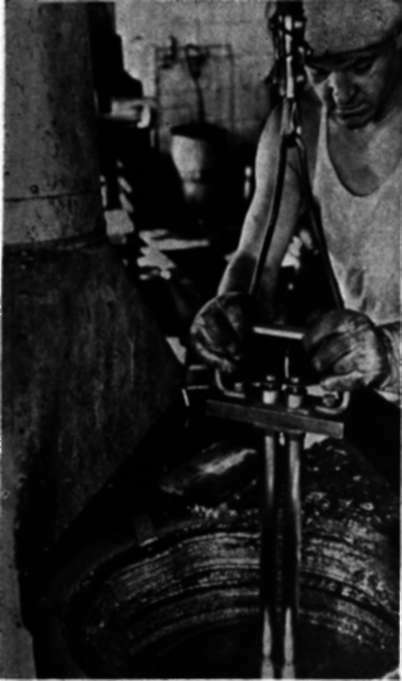 PLATE H. (Lower right) After coming out of the ovens, the hardened shspe is knocked out of the lesden mold by hand, or with pneumatic hammers, and the lead re-melted and used over again. These leaden molds are then stacked a dozen or so on a rolling truck, and rolled into the pouring-room. The "mix" which is then ready to be poured, is run off into small hand-kettles which a man can conveniently carry, the color for that particular batch is mixed in, and the man goes from one mold to the next, pouring the syrup into each leaden cavity. 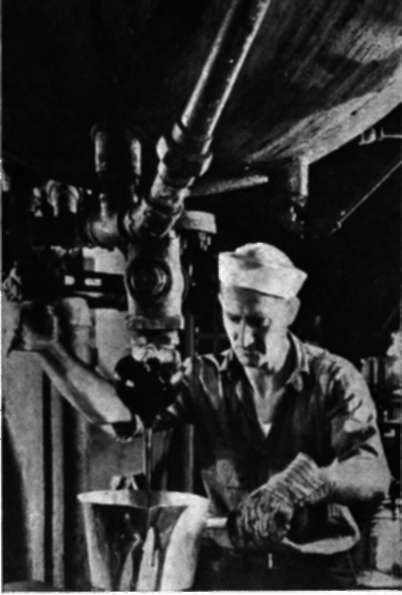 If solid, opaque colors are being run, the color is mixed in the big kettle, but if a mottle is being added to the base color, this mottle is stirred in just before the man pours from the hand-kettle as otherwise the mottle would be too completely mixed with the main color, and the mottled effect lost. Titanium is usually used for white mottles, as it is unaffected by heat or chemicals. The rolling trucks are then rolled into the ovens, where they remain about five days, with their temperature and humidity accurately checked at all times. At the end of that period, the material has hardened completely, the trucks are rolled out, cooled off, and the cast resin shapes removed from the lead molds by tapping the bottom of the mold with hand or pneumatic hammers. At this point it might be well to explain the requirements for special molds, which is a question often asked. It is not possible or practical to attempt to cast a single piece to special order—it is not even economical to have molds made for less than several thousand pieces, even though the molds are comparatively inexpensive as compared with the cost of molds for other plastics. The primary advantage of "cast" resin plastics is that they can be machined, and they are therefore specified for projects of which limited quantities or single pieces are being made. Stock molds are available in hundreds of different shapes, such as buckles, rings, pins, cylinders, scottie-dogs, elephants, stars and countless others (Plate B). These shapes have the cross-sections designated, and run from six to twenty inches long, the manufacturing process consisting merely of slicing off pieces of the desired thickness and polishing them, the outline being automatically created by the shape of the casting. These shapes, of course are in addition to the standard round and square rods, sheets, tubes, etc. Occasionally, the cut-off slices are carved, inlaid, embossed or decorated in other ways. If however you must have a special shape cast to your specifications, bear in mind the following qualifications. First, the average cost of a mold is from fifty to one hundred dollars, depending on the work, and it should be made by a machinist recommended by the plastics companies, and not by a firm inexperienced in making molds for this work. Second it must be designed to have one-way draft, that is, with no undercuts, so that it can be pulled straight out of the lead. No "cores" or inside pieces are possible, although the design can be hollow, with a reverse draft on the inside. Third, extremely thin cross-sections must be avoided, as the material when poured is so thick and syrupy that it does not pour rapidly into cross-sections thinner than 3/16". Fourth, look over all available stock molds before deciding to have a special mold made. next: Can The Resin Be Cast By An Amateur?